Become a member and help support our work to bring more awareness, respect, and compassion into our world. Or become a SUSTAINING MONTHLY DONOR. Monthly donations help ensure we will have a reliable revenue source to continue our work throughout the year. Every person we reach who gives up eating animal products represents over 15,000 lives saved in a lifetime. Your donations save lives. If you would like to become a monthly donor, click the donate button, enter your amount, and then check the box that says "Make this Recurring (Monthly"), as shown in the screenshot below. Thank you so much for your compassion and generosity! Want to make a gift donation in your compassionate friend or family member's honor? Please donate through the link below and include the beneficiary's name, e-mail, and address. We'll send the recipient a welcome card and let them know of your compassionate gift. To earmark a donation for our billboard campaign, please click the donate button below. Thank you! 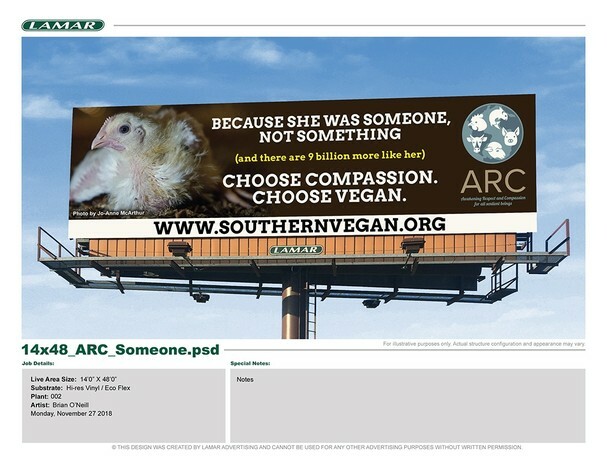 Awakening Respect and Compassion for all Sentient Beings (“ARC”) is a 501(c)3 Tax Exempt Not for Profit Organization. Your donations are tax deductible to the extent as the law allows.